Yesterday on “Car Craft Tuesday” I didn’t do any car crafting. Instead I had coffee with a dear friend and we talked about crafting (among other things) as our toddlers played underfoot. 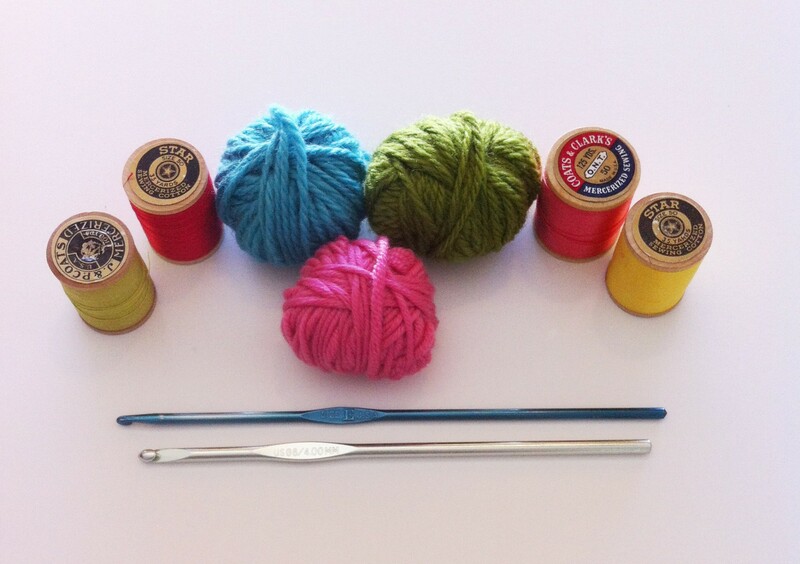 However, I did hit the bed early last night and brought with me my crafting bag…to make up for lost time, you know. I finished the pants that I started for Calvin the week before as well as a second pair that just needed some mending and some elastic added to the ankles. While I was hand stitching this simple little pair of pants, my mind wandered off and I was lost in a sea of memories. You see, these pants are made from exactly that…memories. Lots of them. When I was pregnant with Levi I had this favorite shirt I wore ALL THE TIME. It looked cute when I was just a little pregnant with a pair of leggings and boots and it even looked cute when I was HUGELY pregnant (as shown) and barely fit over my bulging belly. It was just a cheap shirt I bought at Target (I think) on sale one day because I was in need of some psuedo- maternity wear, but it sure got worn a lot. Like on the baby-moon Michael and I took up to Mendocino where we stayed in a quaint little B & B overlooking the ocean in a tiny town called Elk. We fell asleep to the sound of waves crashing and slept beneath big down comforters…one of the most peaceful sleeps I can ever remember. 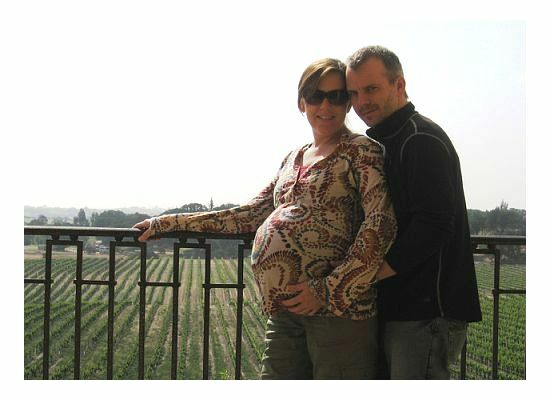 Or the time we worked a wine event down in Paso Robles and on the way back up north we stayed at an Italian villa overlooking its vineyards (again, see the photo above). We had won this overnight from some drawing of which I can’t recall. We had no idea what the place would be like, but we figured a free night’s stay couldn’t be all that bad. Our jaws hit the floor when we walked in the door of our “room”, which was about the size of our house at the time. Plush leather furniture, frescoes on the wall, a huge fireplace, a bottle of champagne and snacks on the table and the biggest four poster bed we had ever seen…not too shabby for a free room!! When I got pregnant with Calvin, I dug out my favorite soft and worn shirt and couldn’t wait to wear it once again. That shirt holds the memory of Levi meeting his baby brother for the very first time. Looking at the picture, it strikes me more to see not how tiny Calvin is, but how little my sweet Levi was. Just 2 1/2 and his whole world was about to change in so many unforeseen ways. 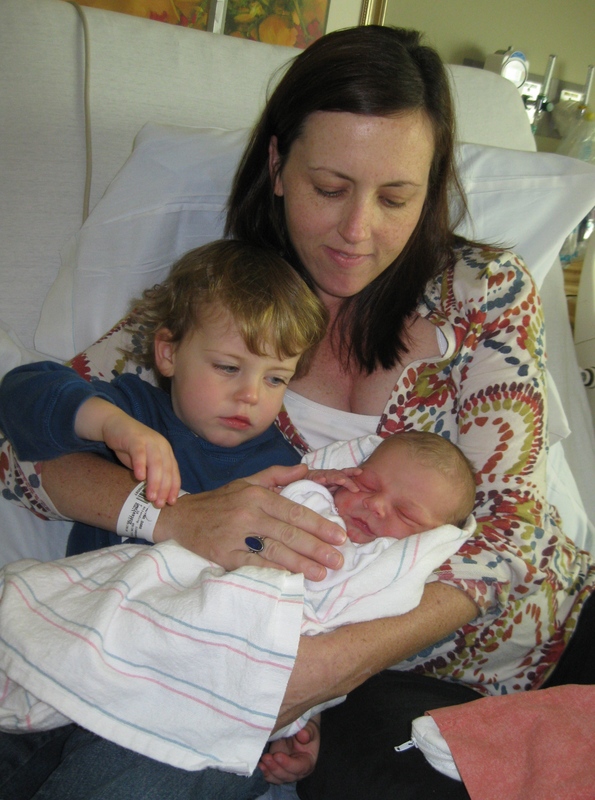 I held both of my boys for the first time wearing that shirt and my arms felt the magnitude of what it was to love and protect two little souls at once. And then one day last year I decided to part ways with that shirt, because let’s face it…I knew I wasn’t having any more babies and when I wore it I looked like I was still pregnant. Not what you want to feel 6 months postpartum. But every time I would go to put it in the thrift store donation box, my heart sank a little. I couldn’t really part with it, even though I was no longer going to wear it. Ah-ha!! I’ll make pants for Levi out of it, I thought. Lord knows there was enough material to go around. 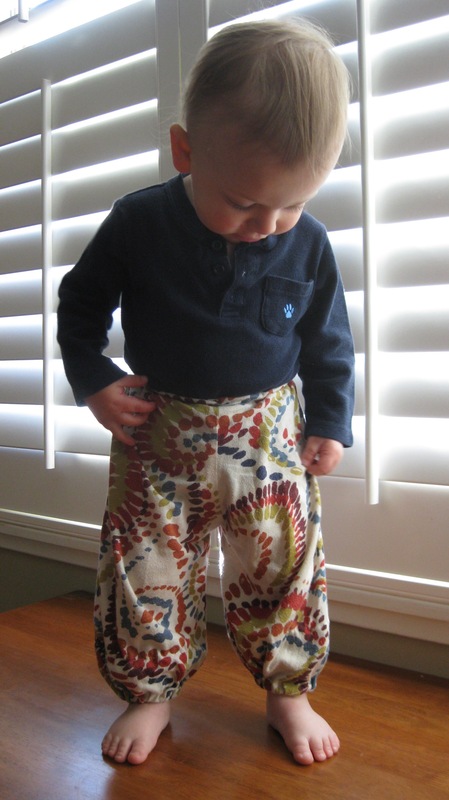 I found an online tutorial for making kids pants out of old t-shirts and it was super easy. (Sorry I don’t remember where I found it, but there are tons of tutorials out there.) 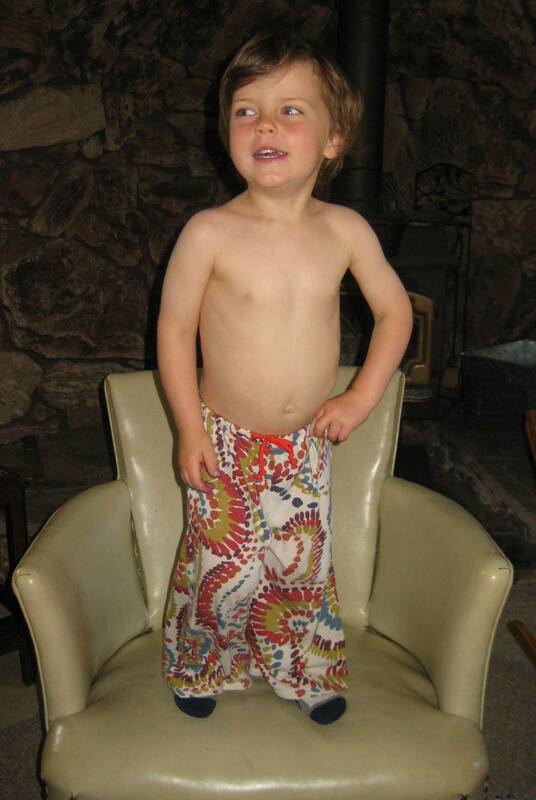 The next day, Levi was sporting some comfy, psychedelic looking play pants. He loved them and said how “cozy and soft” they were, but he soon outgrew them and I put them away in his baby box. Until last week that is, when I pulled them out and thought about little Calvin toddling around in them. They were way too big on him, so I hemmed them up, made the waist smaller and put some elastic at the ankles so he wouldn’t trip on the wide leg design of Levi’s pants. Today he wore them all day and every time I looked at him I smiled and thought how wonderful it was to see that memory-filled fabric again and how special it was that they both had their own version of the same pair of pants. 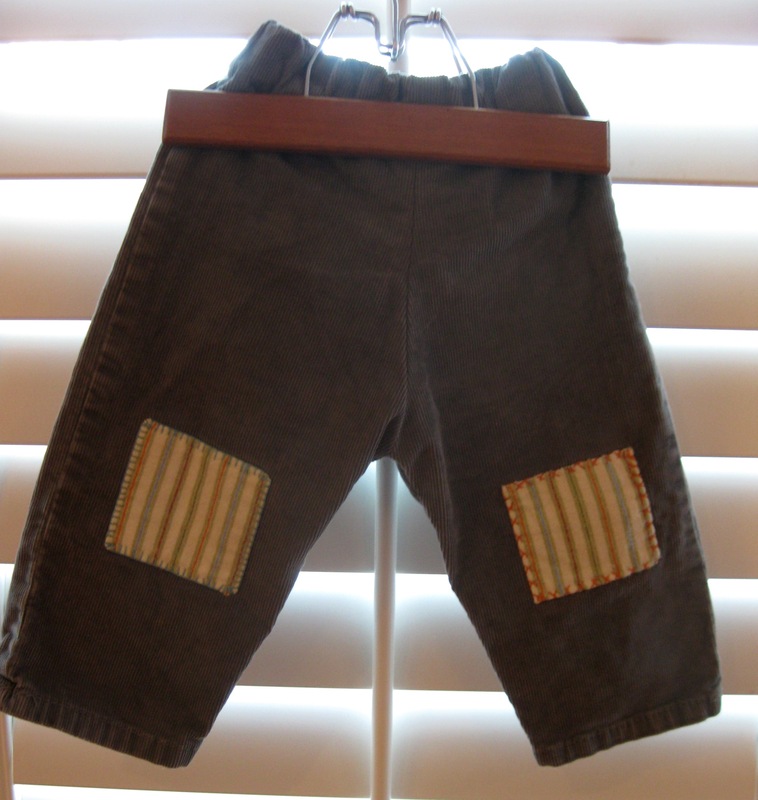 The other pair I made for Calvin came from a pair of Dad’s old corduroys. I made patches from one of Calvin’s old receiving blankets and hand-stitched them on the knees. 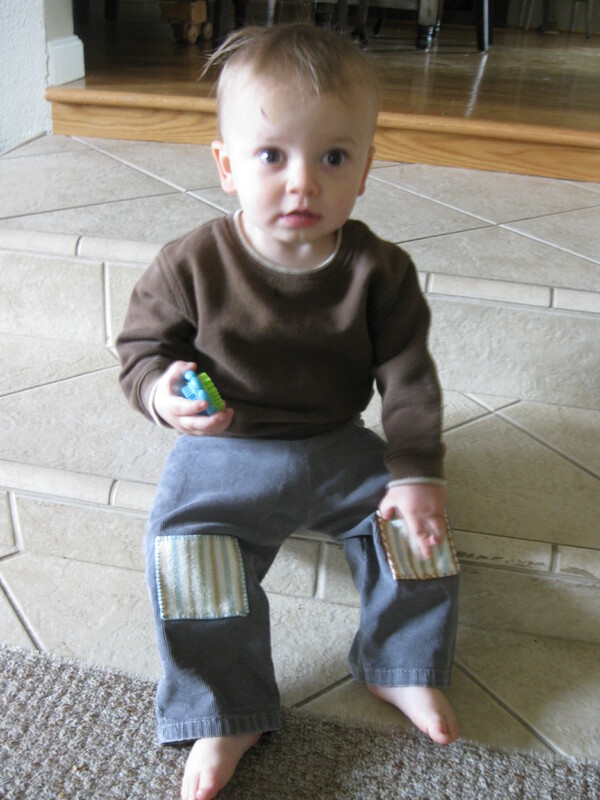 A bit more durable than the t-shirt pants for my rough and tumble little guy who loves to get down close to the ground on his knees…or his head, as demonstrated by the many scrapes and bruises he always has on it. One day far off in the future, I will be looking back through their box of childhood clothes (I save the special stuff) and I will remember this time when they were so small. I’ll hold up the pants and think to myself how little they feel in my hands. I’ll remember the way Calvin walked in them, the messes he made while wearing them. And I’ll think to myself, it’s so true what everyone says…they grow up so fast. Hold on to those memories tightly, I say. D – I love this so much! You are so inspiring!! Thanks, T. Any button sewing help you need, just ask! !